I've really been enjoying Megan Prelinger's book Another Science Fiction: Advertising the Space Race 1957 - 1962. I've lamented the end of America's "reach" in space before in this blog, but Prelinger's book is more than a eulogy for a dead set of dreams. She shows us clearly how the aerospace companies of the Space-Race era recruited employees, wooed politicians, and projected a can-do spirit for technologies that seem alien and exotic to us, like the Nerva Nuclear Rocket. Even companies making ball bearings sexed up their ads with moon bases. It's all a hazy memory from childhood for me, and those are the sorts that so often retain their power best. Madison Avenue was not interested in prediction, in the ads that Prelinger presents. The clients for the era's "Mad Men" wanted to hire the best engineering talent and beat any competitors in getting the next DoD or NASA contract. Showing what might happen in ten or twenty years was a great way to tap the talents coming suddenly out of engineering schools post-Sputnik. I'm certain that Republic Aviation or Sperry did not care, or even conceive it possible, that they were going to break the hearts of hundreds of thousands of geeky kids who saw their ads in the public library, skipping copies of Hot Rod and Sports Illustrated to hunt down ragged back-issues of Aviation Week. There was money to be made in beating the Reds to the moon and even in preparing for what would have been humanity's final technological war. Along the way, we got some amazing space art, some of it heavily inspired by the covers of Astounding, others seeming sprung from the walls of exhibitions by Abstract Expressionist painters. "Long-range research and development work that cannot be expect to have a real need or application until the 1980s must be terminated at this time." To think that, for a shimmering moment in the last years of the 1960s, alongside the wishes for a Woodstock Nation (who became the ever-more-conservative Boomers of the 80s and went for Reagan) we had promises of a lunar base and Mars landing by 1985. I'll never forget the lonely and dog-eared copy of a NASA book on human-crewed Mars exploration that somehow made it onto a table with Apollo documentation in 1973, when I met the Apollo 17 crew in Richmond. It was an artifact for a future that almost happened. At this distance this "other science fiction" of the years before Watergate all seems improbable. Yet had public interest and America's economy not waned in the 70s, a great number of these visions would have come to pass. Others, like nuclear-powered projects that exploded a series of small bombs in earth's atmosphere to reach escape velocity, would have run up against the potent dangers they posed to the earth's biosphere. If anything, such schemes prove that the engineering minds employed by the aerospace titans back then were not holistic thinkers and did not reckon with long-term costs. In 2010 "routine" space travel seems unlikely, America has no concrete plans after the last shuttle retires, China manages a 1960s-style orbital mission every few years, Europe needs to bail out economies and not dream of space. Of course, millionaires can pony up a stack of cash for suborbital joy rides with Richard Branson, touching the Void for a few very expensive moments. Perhaps I'll always be too much a creature of the 20th Century to find solace in other technological developments and too much a Peak Oiler to believe that our species will reach so far again with anything aside from robotic explorers. Experiences in virtual worlds can be immersive, but I'm still chair-bound as I manipulate pixels, not headed out with the first group of colonists to establish the Lunar International University's first campus. The type of future on Prelinger's advertisements provided a dream of a transhumanism unlike that of today's merge-with-the-computer futurists. As a spacefaring race, humanity would be one with its spacecraft and colonies. We'd have left the cradle and have transcended our biological origins with hardware. Perhaps today's Transhumanists can upload their intelligences into robotic probes and reach for the stars. 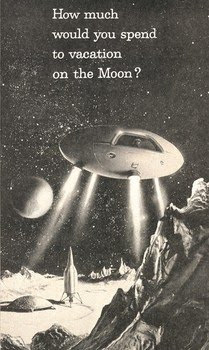 Forty Years on, that possibility repels me, so I'm still waiting for my "ride" to the final frontier. In another forty, I'll get it, but it won't be in a spacecraft and I won't be able to blog about it.